Average Black Girl is a marketing firm with a focus to create more black millionaires. We cover positive black content in every area of life. We welcome posts that cover a variety of topics including but not limited to a business, marketing tips, relationships, friendships, networking, DIY, cooking, current events, and AHA moments. Once you read the criteria, submit your article to admin@melaninbusiness.com! All Guest Post Must Comply With The Following Criteria. Guest Posts must be your own original work that has not been published on any other website, forum, chat or social media network. Plagiarism or copyright infringements is not permitted. When quoting others, please make sure to properly cite your source. Posts will acknowledge your authorship, but will be the property of Average Black Girl. Once the post has been submitted to Average Black Girl you may not publish it anywhere online, in part or in whole, besides your own website or blog. If we use your guest post, you may promote it on your own website, Facebook, Twitter or other social media forums. Promoting does not mean you post the entire article on these forums. You may include a link to your guest post and a short sentence or two explaining what the article is about. Once you are chosen, we will make you a user so your articles show you as the author. Once you have a user account, it is expected that you fill out the Gravatar. Submissions should be kept between 200 – 1,000 words. Longer posts are allowed if it is necessary and relevant, but Average Black Girl decides the final length of the article. Affiliate links are permitted but must be mentioned in the blog post in guest post submissions. Average Black Girl reserves the right to add its own affiliate links where appropriate. Guest Post writers will receive writing credit as author of their post at the beginning of the article. Guest Post writers may submit a short bio statement (no more than 50 words) that may or may not be used at the beginning of the article. Guest Post writers will be allowed to have link to their website and social media accounts. Guest Post writers may provide a photo that may or may not be used. We do not pay for submissions. If you decide to submit a post to our site, you do so with the knowledge that you shall not be entitled to any compensation for writing the post or for any other compensation related to the post. A. The Guest Post writer must be the copyright holder of the image/video OR the image/video must be licensed under an appropriate creative commons license or in the public domain. Proof must be submitted along with any image/video showing that it does not infringe on copyright laws. Average Black Girl reserves the right to change/edit the image/video if necessary. If people are included in the image/video, then the Guest Post writer must provide a written release allowing use of likeness. Video/image submissions must be relevant to the post. Average Black Girl reserves the right to deny or remove any image/video it deems inappropriate or contrary to the values of the Average Black Girl company and brand. Average Black Girl will share and promote the Guest Post on a variety of social media networks, but does not guarantee any particular site or audience reach. Links to any third-party site must be relevant to the topic and approved by Average Black Girl. All search engine optimization (“SEO”) information, such as anchor text or alt tags, will be reviewed and subject to inclusion at the discretion of Average Black Girl. Excessive links or links that appear to be affiliated or spam related will be removed at the discretion of Average Black Girl. All Guest Posts are reviewed and approved by Average Black Girl prior to posting. Average Black Girl reserves the right to edit Guest Posts where necessary. 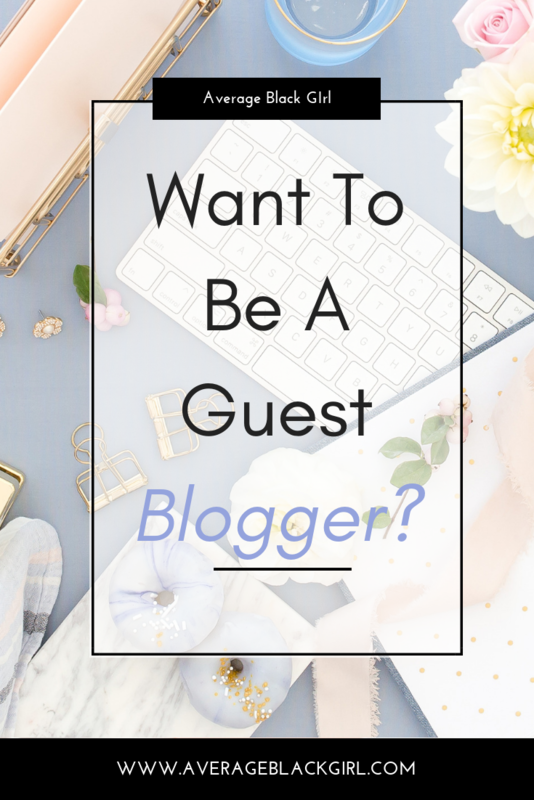 Grab The Guest Blogger Agreement Below! Stop Getting Mad At Your Friends For Not Supporting You.